Local internet, TV, and phone services provider BendBroadband has launched another installment of its internet campaign, this time featuring Sisters resident June Jaeger. Building on the company’s promotional series that highlights inspiring Central Oregonians such as Ultra Runner Max King, and chainsaw artist Skip Armstrong, Jaeger will be featured for her quilting. The metaphors of hard work, precision, and community that play out in the TV commercial are not lost on Jaeger. Between all of her commitments, she narrowly had time to accept a commissioned project for BendBroadband: to design and create a custom quilt for the 2017 Sisters Outdoor Quilt Show. “I knew I wanted to make room in my schedule for this project,” says Jaeger. The resulting quilt, documented in the TV commercial, is a brilliant representation of BendBroadband’s logo. The image of a running dog is expressively captured in fabric pieces using the company’s characteristic orange, which is paired unexpectedly with textured violets, yellows and cream hues. Set on a black backdrop, with subtle stitching of the Cascades Mountain Range, June’s style is ever-present in the piece. The quilt will be on display at the quilt show and incorporated into promotions this summer. The 36” by 50” quilt took about six weeks to complete, Jaeger says. Jaeger has been quilting for more than 45 years and credits her sister Jean Wells for introducing her to the craft. Wells owns Stitchin’ Post on West Cascade Street, where Jaeger often teaches classes. Both sisters will be active at the quilt show, with Jaeger teaching five days in a row preceding the event. 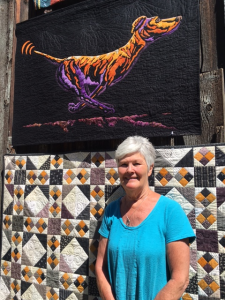 In addition to teaching, Jaeger designs quilt patterns and has authored two books on quilting, Adventures in Landscape Quilting and Best Friends Animal Portrait Quilts. “I’ve always been interested in animals and the outdoors,” she says. With an anticipated 12,000 attendees, June says the Sisters Quilt Show has put Sisters on the map. BendBroadband is a longtime sponsor of the event and will be offering free public Wi-Fi at the show on July 8. To view the TV commercial featuring June Jaeger visit bendbroadband.com/connect.